In the days that followed the bustling private view, it was easier to see the show as a visual document and I took the time to view it with fresh eyes. Arriving before the show opened in order to invidulate, the brewery held its breath and felt more like a museum of bizarre artefacts, now with their own presence within this silent and gargantuan industrial space. My own drawings hung still, held aloft only by meagre masking tape. Inarguably simplistic in their presentation (especially considering the photographer exhibiting next to me had built their own soil-covered room to house their images), I enjoyed the edition of the brick canvas but largely allowed the drawings to speak for themselves. The ongoing project from which they were taken, Please Wait… documents scenes of suspended motion in a culture that never stops. I see the ordinary situations depicted here as exquisite moments of serenity where nothing is demanded of us and we are free to think and to exist, so took great joy in seeing people pausing to reflect on them for a time. Admittedly speaking against the priorities of every coffee-fuelled Londoner that passed me on the escalator on the way in, the drawings express the philosophy that waiting can be everything that we are rushing around trying to achieve. Perhaps they should try it. Left: Agent Zigzag series by Jack Molyneux. Right: James Hadley's furry props from The Gnarwolf. Synthia magazine in situ in the reading area. Original wall drawing [detail] by Maria Midttun as part of her 87 Octane narrative. Left: Collages by James Hastie. Right: Formless & Hearing Visions series by Glen Clothier. Children drawing Hollie Mackenzie's Downfall. Thames Trumpet floor vinyl by Kieran Leonard. The Wilson Project by George Bills. One of my favourite things about how the show functioned was the artwork's interaction with the idiosyncratic brewery space. Artists worked directly onto the walls and floor, Mackenzie's stairs looked as if they could have once been part of the room's structure and Hastie & Clothier's digital pieces were framed by pipes and industrial remnants; the environment was embraced to symbiotic effect. The vernacular of the space did not detract away from the artefacts placed there, but did add something new that the pieces successfully bounced off; a reward to those artists who created artwork possessing the ability to hold its own whilst not being afraid to absorb qualities and moods from its surroundings. Feral opened its doors to the public on 5th July. Sharing the private view date with multiple other visual arts graduate shows including Mixed Special, Now What, and Rare, London was somewhat spoilt for choice on this night. Nevertheless, Feral held its own against these big names and received an enormous body of visitors, ready and willing for a wild night of creative curiosities. Highlights of the night included the space-suit coated Fred Nicholas performing "Beyond", the popular illustration reading area, and the custom Feral wolf tattoos. Here is me repping mine in front of my exhibited collection of drawings, 'Please Wait...'. The chance to relax and have a drink or four with our fantastic tutors amidst a sea of happy visitors was a fitting and truly priceless reward for the taxing final year ails. Thanks for a great show everyone. On 3rd July the graft to transform The Old Truman Brewery into our end of year show 'Feral' began. 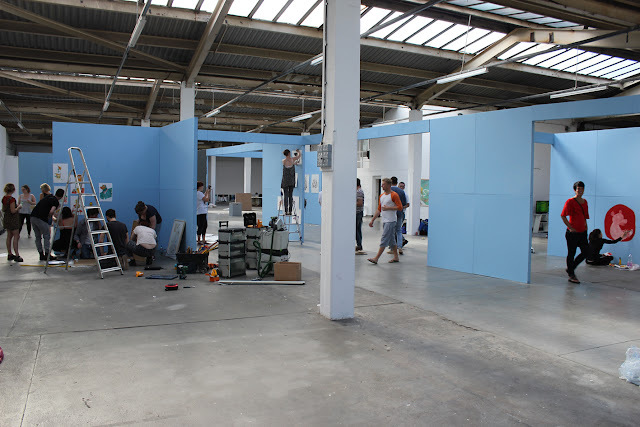 The largest exhibition space in the Free Range event, T1 - as pictured - was vast, empty, and full of promise, set to become the home of the work of AUCB fine art, illustration and photography graduates for the next week. A strong sense of community was felt from the moment we arrived, with the vast yet mutually beneficial task of constructing the greatest show we could requiring people to work together and share the load. From unloading all the artwork from the vans - most precious, heavy, or both - and carrying it up two flights of stairs, to assembling the boards, painting, installing the work, and cleaning up, the days leading up to the show were back breaking, amplified by the heat of the room. The resultant design was free-flowing and open and made the most of the brewery's expanse without filling it, aiming to cement itself in people's memory by reflecting the blue sky coming from above in the colour of the constructed walls. The curation process was fairly organic, with work blending between disciplines and themes to lead the visitor around the space but leave them room to explore. With plants, broken glass, costumes and furry bits, it was easy to create a surprise around every corner due to the diversity and wildness of this year's output. It was unmistakable that the drive for all was to create an exhibition arena that showcased the hard work we had already put in throughout the year to the best possible degree, and I think what we created together in this space was a testament to both our personal efforts to create thought-provoking boundary-pushing work, and the efforts of those who unconditionally helped us along the way.